Backpacker and Mt. McKinley, Denali National Park, Alaska. I thought I’d continue on my little slideshow of Denali photos. I got to shoot the mountain more this summer, in one short week, than in all of my previous sojourns into the park. Call it good luck, or call it persistence, or call if what you will, I had a great time in Denali. Mt. McKinley is certainly one of the grand mountains of North America, and probably the world. Denali so dominates the landscape that when it’s out, shooting any other photo, often even wildlife, makes me feel slightly guilty. Sometimes I’ll take some photos of Mt. McKinley, then look around for other interesting compositions or subjects, particularly if the light is good, but I can’t help look back over my shoulder at Denali, and “What are you thinking, Carl, THERE’S your subject” runs through my mind .. time and again. I took this photo after breakfast, and was finishing up with a cup of coffee, and I thought, that’d be a cool shot, coffee and the mountain. Thank the Lord for a built-in timer on the camera, and a solid tripod. As always, for stock shots, I took a few frames, vertical and horizontal compositions, but I like this one the best. I enjoyed the coffee. Coincidentally, for backcountry coffee, you can’t beat Mary Jane’s Farm – their dehydrated organic coffee is awesome. It tastes like real coffee, with no grounds to clean up or pack out afterwards – that’s always a plus in my book! 🙂 I don’t know if they’re still selling it, but I see they have a few new products I’m keen to try out next season here. Bummer if they aren’t gunna do their coffee again! This photo was taken a couple of hundred yards away from the last one. Why? Because it’s not good form to eat near your camp in bear country. So I set up my tent, and set up a little kitchen/cooking/eating area a short distance away. This one is a little further than normal, across the other side of a small kettle pond, up on a ridge. It’s a pretty sweet view to have dinner/breakfast by. 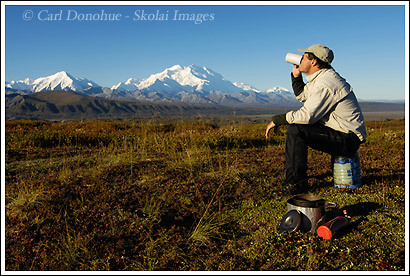 PS: You can see more photos from Denali National Park here. This entry was posted in Adventures, Alaska, Backpacking and Hiking, Denali National Park, Landscapes, Travel on October 12, 2007 by Carl D.
The picture says it all. Really cool! !